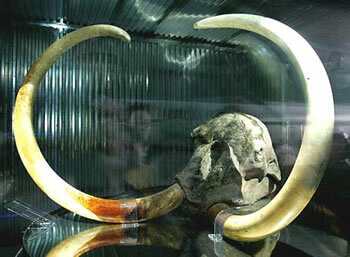 Scientists with the Mammoth Creation Project hope to find a frozen woolly mammoth specimen with sperm DNA. The sperm DNA would then be injected into a female elephant; by repeating the procedure with offspring, a creature 88% mammoth could be produced within fifty years. Woolly mammoths became extinct about 10,000 years ago as warming weather reduced their food sources. Although only about a hundred specimens have been found, as many as ten million mammoths are believed buried in permanently frozen Russian soil. Iritani has already picked out a preserve for living mammoths in northern Siberia; this "Pleistocene Park" would feature extinct species of deer, woolly rhinoceroses and maybe even saber-toothed cats, along with the mammoths. In his novel Jurassic Park, Michael Crichton popularized the idea of using dinosaur DNA taken from mosquito-like insects trapped in amber to create a Jurassic Park of recreated dinosaurs. Unhappily for the Pleistocene Park planners, both books and all three movies ended badly for most of the participants, including the investors. Also, astute scientists are already pointing out that these experiments would merely create mammoth-like creatures, not mammoths themselves. This wasn't pointed out until the third movie in the Jurassic Park series. Update 03-Apr-2014: As far as I know the earliest reference to this idea in sf is the mammontelephas from David Brin's 1990 novel Earth. End update. Read more at Woolly Mammoth Resurrection. You might also be interested in related SF in the News stories: Cloned cats have n+1 lives and Glofish - the first genetically modified pet. Thanks to The Daily Grail for finding this story.